Contexts magazine is one of the premier sources for sound sociological research and interpretation, written for the educated lay reader. 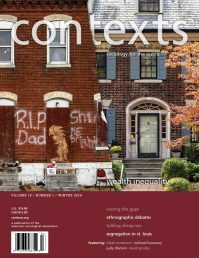 Contexts examines the dynamics of society from a sociological perspective, offering summaries of the latest social science research findings, timely feature articles on topical issues, and culture and book reviews. Send me a sample issue. Add me to your media list. Searching for a sociological Perspective? Sociologists are available for media interviews. Contact ASA at pubinfo@asanet.org.